Are you having trouble when it comes to getting your young loved one an overnight diaper that will keep him/her throughout the night without getting up in the late midnight to change to avoid dripping in the morning? Well, say no more to such issues as you read this article on the best overnight diapers for your kid. It outlines on how to choose the best overnight diaper, its advantages, what to look for when buying an overnight diaper, and the top five best diapers that make your baby dry and more comfortable. What to Consider When Choosing an Overnight Diaper. Simple Steps On How To Change Overnight Baby Diapers. A Quick Comparison of the Top 5 Best Overnight Diapers. 1. 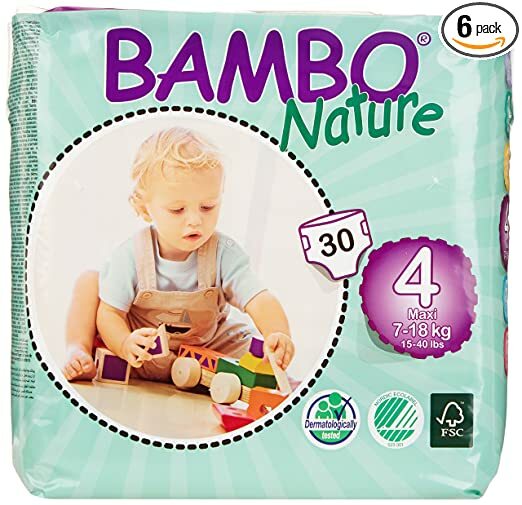 Bambo Nature Maxi Baby Diapers. 4. Seventh Generation Baby Diapers. Overnight diapers have benefits over others diapers used since you may want to avoid the tiresome task of changing diapers in the middle of the night. These diapers are known to serve you kid for up to 12 hours without leaking. • Absorbent- overnight diapers consist of two fibers that boost the absorption of leakages during the night. These diapers also allow insertion of absorbent materials to achieve enough absorbency. • Breathable- to reduce the odors from the leakages and bacterial growth that result into rashes, a good overnight diaper should have a breathable cover. The covers should be able to repel and at the same time absorb moisture. • Comfortable- since an overnight diaper is used for a long duration, it has to be comfortable to the kid to avoid waking up in the night. The diaper should easily fit and be of the right size to avoid being bulky and uncomfortable to the child. Parents need to consider numerous factors when it comes to buying of overnight diapers. Some of this mentioned in this article. Diapers are either of cloth or disposable types. Though disposable diapers are more expensive, they are considered as more efficient and convenient for use compared to cloth diapers that need to be washed. Cloth diapers require being washed after each use and replaced by clean ones, making it less expensive compared to the disposable that needs to be bought each and every time. Overnight diapers have different features that need to be considered to meet your demands as a parent. Some of this include changing color wetness indicator, type of fasteners, how it fits, and the absorbent capacity. This will help you in picking the best overnight diaper depending on how your kid wets. A useful feature should be as a good distribution system to the absorbent core. Due to the wide variety of overnight diapers currently available in the market, one should read the previous users on the brand of the diaper and know if it’s worth spending your money on. Customer reviews are the simplest way to get the right information about a product especially when it comes to baby stuff. The layers should consist of good materials that have a good distribution and prevent the leakage of urine during the night. The main parts of a disposable diaper should be composed of a top sheet, absorbent core and a waterproof shell on the outside. Sizes should be available as per the baby’s weight to avoid the diaper not fitting leading to leaks. The diaper should fit symmetrically on all sides without being too high or low on the waist. This section shows the appropriate ways on how to change baby diapers and to prevent the development of rashes and other skin complications on your toddler. • Collect all the supplies that you need to change the diapers close to you. • Let the baby lie on his back on the changing table and unfold a clean, dry diaper to one side. • Have another clean diaper beneath the baby. Distract the child by singing or making funny facial expressions to allow change of diaper without distraction. • Clean any mess on the baby by carefully wiping clean the creases. You can use baby oil and a soft piece of cloth to remove the stools quickly. • Apply a diaper cream or powder and leave the area to dry so as to prevent rashes. Remember to do the same to the red spots with rashes. • Put the clean unfolded diaper that you had before under the baby’s bottom by lifting his legs. Fasten the front part of the diaper between the baby’s legs. • Carefully fold the used diaper and dispose to avoid the odor. Wash your hands with soap and warm water, and there you go! ** Below, are more detailed reviews, but you can click these links above to see current prices and read customer's reviews on Amazon. Bambo Nature Baby Diapers﻿﻿﻿﻿﻿ are high-quality overnight diapers that every parent may want to try out on their baby. This product has an outstanding feature of good health to the baby as it has no dangerous chemicals that may result in your toddler developing rashes and health complications. They are baby friendly and does not expose the kid to skin complications and breathing problems. With their high absorbency and soft texture, they provide the comfort that a child may need throughout the night without the need to change the diaper. Well designed with the appropriate fibers to minimize health complications to the baby’s skin. Eco-friendly and more natural, just as from the name, making them different from other diapers in the market. Prone to leakage as they do not have a good hold on the baby. Are the modified version of the Overnight diapers as they have better protection, material, wetness indicator, and even distribution system. 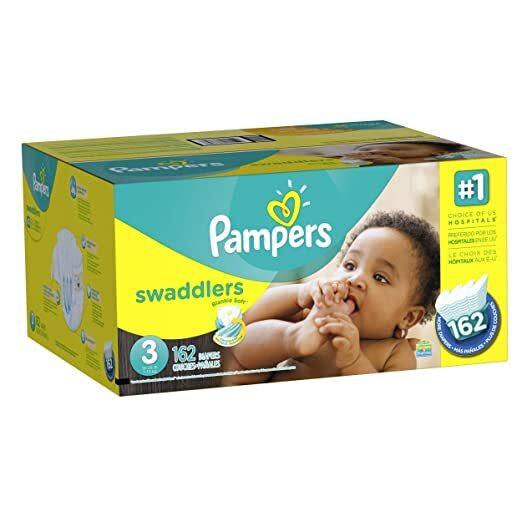 Pampers Swaddlers Diaper﻿s have a gelling substance that helps in moisture absorption by providing a larger intake area. The wetness indicator on the diaper notifies on when the diaper is to be wet by changing the color to blue helping the parents to know when to change the diapers when it is wet. Reviews from the previous users show that the diaper gets loose and opens when it is saturated resulting to absorbent gel pearls spilling on the baby’s legs and rear body parts. Although this might not harm the baby as claimed by the manufacturer, it can result to irritations to the skin causing health complications. It has no dangerous chemicals and considers health issues and therefore does not cause rashes. Has a color notifying wetness indicator. Has extra thin layers that become oversaturated with urine faster. Spillage of the soft gel pearls when oversaturated. Huggies Overnight Diapers are the best overnight diapers that provide a long time service as it gives protection for over 12 hours enabling the parent to sleep without any interference of the need to change the diaper at night. These products have the best leak lock system that allows increased absorption of the leakages. The waistband is also flexible and has a nice lock on the baby ensuring no leaks during the night and does not tighten the baby’s skin. Another fantastic feature about these overnight diapers is that they are not perfumed to avoid any chemical reaction to the baby’s skin. Though some users complain of the chemical smell of the diapers when washed, this helps keep the child safe and free from any health problems. It is made up of soft materials that make the baby cozy and always dry. Diapers made of extra quality materials to ensure no leakage for up to 12 hours. Diapers not perfumed to avoid skin allergies and reaction to the baby’s skin that might cause rashes. Has chemical smell when washed that can affect the baby health wise. New diapers in the market have no different characters on them as the previous ones. Made of biodegradable materials, Seventh Generation Baby Diapers are environmentally friendly when disposed of, making them entirely different from other diapers in the market. No damage was done to the trees in their production as they are made of renewable resources. These type of diapers are the best for children with skin diseases and rashes as they are manufactured from natural substances, and therefore no dangerous chemicals or toxic elements were added that might cause health complications to the kid. They are not perfumed, at the same time ensuring they don’t produce the chemical smell when washed. Although they are baby friendly, most of the previous users complain of these diapers dripping wet as they do not have enough absorption capacity. Only after a few hours of wear, the baby is already wet, disturbing both their sleep and parents. 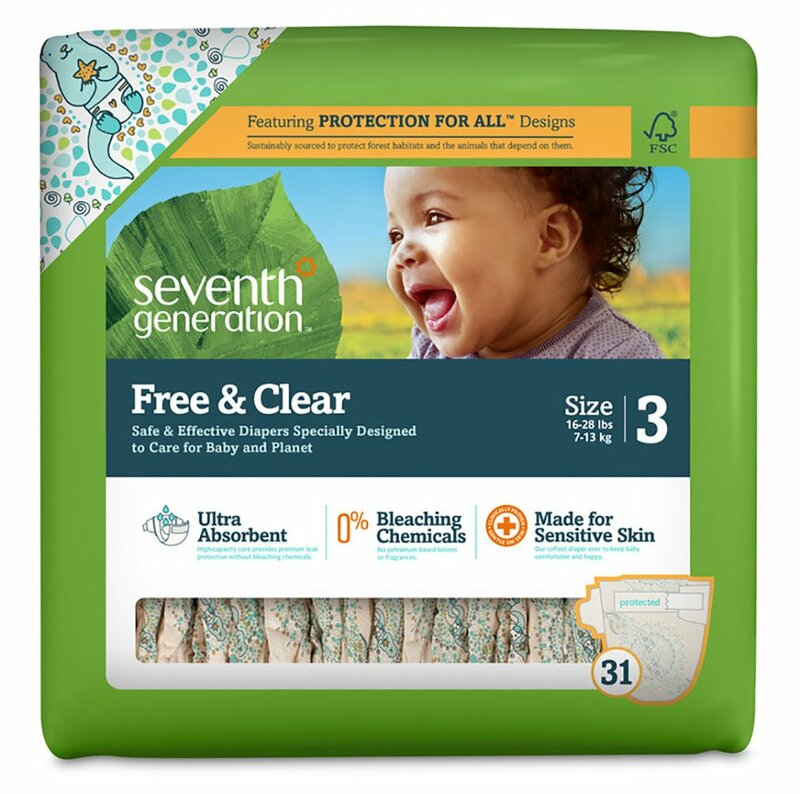 Seventh Generation Baby Diapers may be friendly to your toddler but is not that long lasting to give the 12hours protection that enables you to sleep without any disturbance of changing the diapers. They are not the ideal choice of overnight diapers to go for. Are eco-friendly as they are biodegradable, hence no pollution of the environment. Manufactured from non-toxic materials ensuring the safety of the baby. Are the best for children with sensitive skins and rashes. Produces no chemical smell when soaked. It does not last long enough due to its reduced absorbance making it unsuitable for a night diaper. 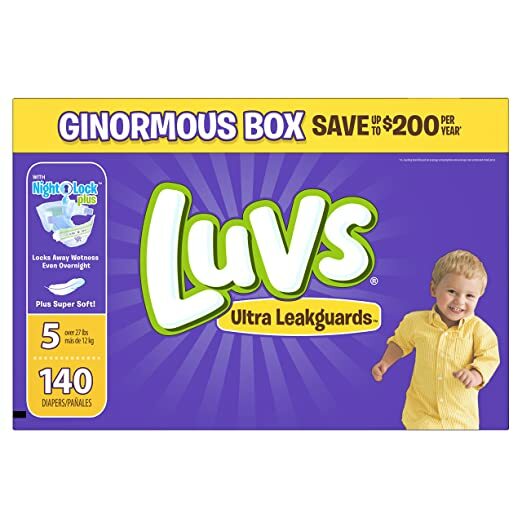 Luvs Ultra Leakguards Diapers are budget-friendly to parents who want to protect their babies overnight from leakages, as it ensures a money-back guarantee for those who don’t meet their demands. With the Leakguard core, they keep the baby dry and provide the comfy the child needs to sleep during the night. These products come with a NightLock Plus feature that helps keep the baby dry. They are large with a wide fastening area to comfortably fit the child and make changing faster and quicker. These diapers are available in a wide range, from newborns to size six, allowing its use for wide ages of babies. Luvs Ultra Leakguards Diapers also have fun designs in various packs making it more baby friendly. These products are therefore very efficient for such a cost friendly price. Has a comfortable texture that is soft o the baby’s skin, making it cozy. Has a wide fastening area for faster changing. Manufacturers offer a money-back guarantee if the user is not satisfied with the product. Previous users complain of the new version being thinner and less absorbent compared to the earlier versions. 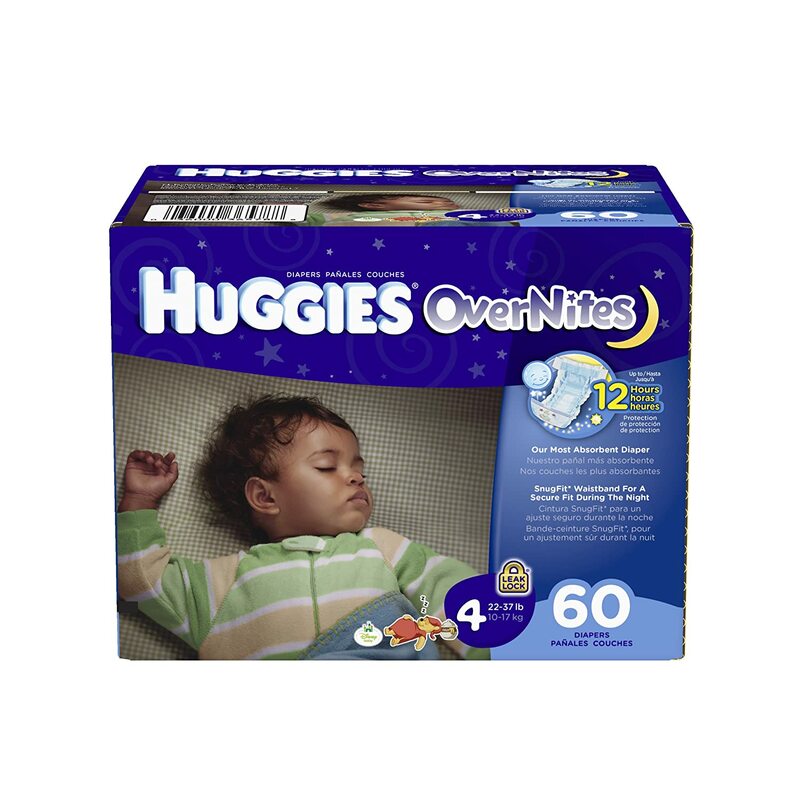 After an in-depth review and testing, my favorite overnight diaper is Huggies OverNites Diapers. These products are baby-friendly and the perfect choice for parents and babies with sensitive and strong smell senses as they are not perfumed. They have a good absorption capacity and are durable making them provide enough sleep to both the baby and parent as there is no need of the change of diapers in the middle of the night. They are also known to b cozy and soft to the baby’s skin. With their outstanding performance and low price, Huggies OverNites Diapers are the best for you and your kid. 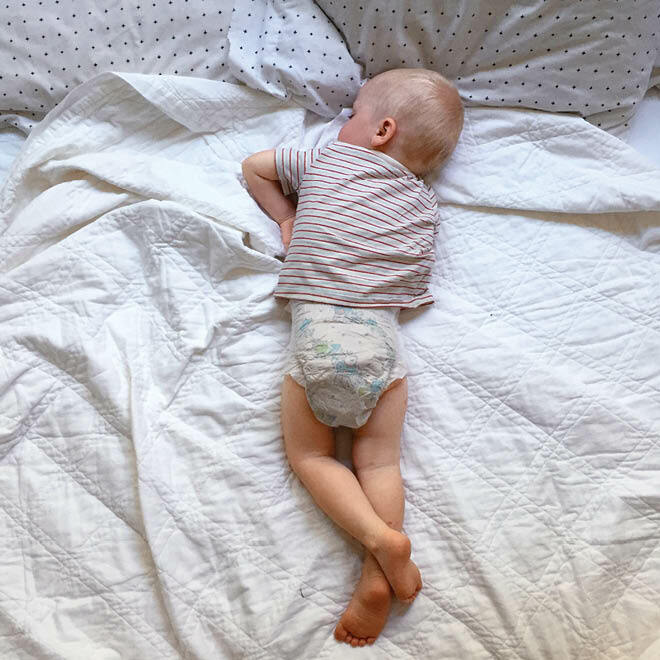 Although you might have a different opinion to mine, some of the overnight diapers mentioned in this article might feel better for you. Kindly share this information with other parents and friends who might have difficulties in choosing the right overnight diaper. Looking For Healthy Food for Toddlers?